The Ireland centre is expected to make his first start since April after visiting New Zealand for a wedding. 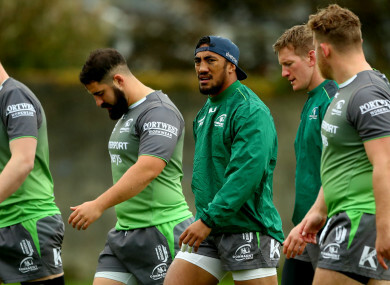 CONNACHT COACH ANDY Friend says Bundee Aki is chomping at the bit for game-time and he expects him to have a big impact over the coming weeks and months. Aki played his first game for Connacht since April when he came off the bench in the 17-10 loss away to Edinburgh last weekend. And the 28-year old Irish international is poised for his first start tomorrow when Connacht host Scarlets. It will be Aki’s first game at the Sportsground since they hammered Leinster 47-10 in the final of last season. Coach Kieran Keane was fired just two days later and his successor Friend says a lot has changed in the months since Aki last started. Aki is only returning to action after featuring for Ireland in Australia and the centre also enjoyed a short break back in New Zealand before the season started. “He’s been brilliant, in fairness to him. He came back from New Zealand after that second stint and he has really bought into the group,” said Friend. “There’s good energy there and I think he would be the first to admit that he was a bit rusty on Friday night but he has been away from Connacht rugby now for over four or five months. His last game was in April and I think it is probably a sign of where the squad has come as well, it’s a different squad that he is playing with now and there are different lines and different speed of moves happening, different communications but he is a quality rugby player. “He just needed that hit-out at the weekend against Edinburgh and he is going to be fine from here on it,” added Friend. Connacht are looking for their second win of the campaign, having gone down at home to Glasgow Warriors and away to Edinburgh either side of a 32-13 win over Zebre. Email “'I think he'd be first to admit that he was a bit rusty': Friend expecting big impact from Bundee Aki”. Feedback on “'I think he'd be first to admit that he was a bit rusty': Friend expecting big impact from Bundee Aki”.